Solar West is in the business of providing cost effective and innovative solutions to watering your livestock while using the most up to date and environmentally friendly technology available. Our watering systems can be portable or stationary and use solar and wind power to provide clean water in areas where no power is available. There are many proven financial and health benefits when livestock have a clean source of water. Solar West watering systems keep livestock out of lakes, rivers, streams and dugouts, preserving our fresh water, which has been (and should be) a top priority for governments as well as many ranchers. Why Choose an Alternative Watering System? A lot of independent research has gone into understanding the benefits of using alternative watering systems over traditional methods of watering. Much of the research agrees that the advantages are numerous and ultimately lead to reduced costs, improved gains, and healthier animals. You will also see benefits from saving time, peace of mind, and making a positive impact on the environment! 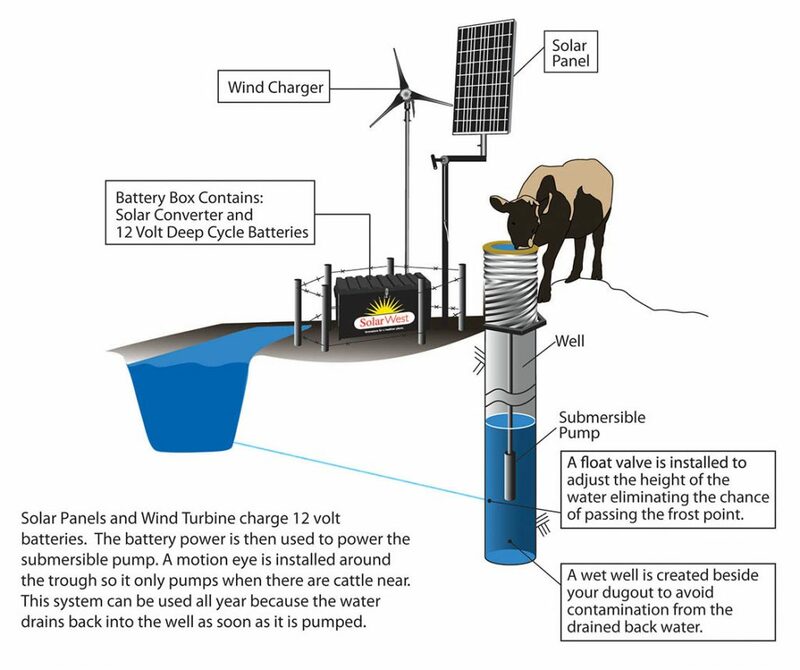 A solar powered watering system will keep cattle out of open water sources that could otherwise become contaminated with excrement and saliva. This may lead to additional problems such as hoof rot and accidental drowning. Providing your livestock with a constant source of fresh, clean water has many positive impacts on the overall health of the animals, reducing costs associated with vet bills and medication. With a winter watering system, you can allow your herds to winter graze, reducing the cost of spreading manure in the spring and increasing the production of your pasture and hay crops. The formula is simple; with cleaner water your livestock will drink more, and when they drink more they consume more feed. With the increase in feed consumption you will see greater gains in your livestock. Once a watering system is installed, there is no day-to-day operation required. With only some maintenance from time to time, you can spend less time watering your livestock and more time on the important things. A watering system means you don’t have to worry about cattle accidentally drowning, deteriorated banks, or the quality of water in your troughs. Many Governments and Watershed Authorities are passing bylaws against livestock having direct access to fresh, open watering sources. You can preserve that lake, stream or dugout by setting up an alternative watering system. You can further reduce your impact on the environment by using a solar powered system. There are many benefits to choosing an alternative watering solution. These benefits include greater gains, healthier herds, and the preservation of surface water sources. Understanding that a system is right for you is the first step; choosing the stem that give the best value is the next step. At Solar West we work extremely hard to ensure our customers get the highest value for their money. We focus on building high quality products that last, and always keep our customer’s needs in mind. There are many benefits to choosing a Solar West system! With a long family history of producing cattle, we understand what makes sense to ranchers. We have built a product that is easy to set up and take down. We have also designed a line that is completely portable, easily towed by an ATV. Most systems you buy from our competitors do not come complete. At Solar West we want to ensure that you can use the system as soon as you get it to the pasture. That is why we make sure all of our systems come complete with all of the hoses, cords and essentials you need to run the system.